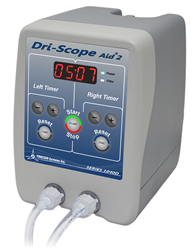 Dri-Scope Aid®2 now offers a dual timer to dry two endoscopes (Olympus, Pentax, and Fuji) simultaneously with independent start and stop times. The Dri-Scope Aid®2 provides HEPA-filtered air to aid in the drying of all internal endoscope channels. The Dri-Scope Aid®2 with dual timers is the solution scope users have been searching for to easily push HEPA-filtered air through all internal channels of the scope. For more information on Dri-Scope Aid®2, call 508-423-3223, e-mail sales(at)driscope(dot)com and visit http://www.driscope.com. TRICOR is a small, progressive business actively involved for 40 years in the design, development, and manufacture of military, aerospace and medical electronic equipment / instrumentation, as well as various other products including software. TRICOR's ability for a quick turn-around from product inception to delivery is what sets us apart from our competitors. TRICOR customers include many Fortune 500 companies within the aerospace, defense and medical industries.